The original Gonzo journalist (Proud Highway, 1997, etc.) spent a sober afternoon going through his archives to find this unpublished novel (his only fiction), written at the start of his career. He might as well have let it rest in peace. Thompson’s great achievement as a writer, of course, has been the role he played in the development of the “new journalism”of the1960s. 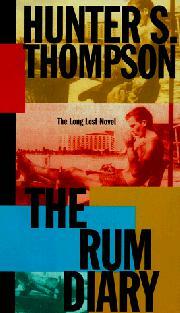 Making the most of a vicious wit, sharp tongue, and riotous imagination, Thompson infused his reporting—most famously, Fear and Loathing in Las Vegas—with a vigor and depth of personality usually associated more with novels than with newspapers, helping thereby to raise the literary status of nonfiction. It’s hardly a surprise, then, to learn that Thompson has had a novel locked away in a desk drawer all these years. What’s surprising is how much less compelling it is than his journalism. Paul Kemp, the narrator, is a young New Yorker starting out as a newspaperman in Puerto Rico in the late —50s. Soon after arriving in San Juan, he manages to land a job at the Daily News, an English- language rag whose staff—an assortment of has-beens, mad geniuses, drunks, and spongers—would seem more at home in the Foreign Legion. The legendary Thompson manner (“Arriving half-drunk in a foreign place is hard on the nerves”) is flourished here, all right, and the typical Thompson high jinks of public misbehavior and private lewdness make up most of the story, which is more portrait than tale. There are fights in bars and trouble with cops. There are crazy chicks from Smith who like to undress in public. There are writers who, though broke, always manage to get an assignment just before their landlady evicts them. And through the whole of it, there is one febrile intelligence noticing and reporting on everything that takes place both inside and outside of himself. A fun drive that takes you nowhere much. Thompson fans won—t be disappointed, of course, but most everyone else would be better off going to Henry Miller for that sort of thing.